We got up at 6:00 am and did some packing before having breakfast at 7:00. My wife lost a filling out of one of her molars. We finished packing and called a taxi to take us to the Avis rental office. We had requested a small Mercedes like we had in Germany but they only had a 4 door Opal. Last year in advance of our trip to Germany, we reserved a VW to be picked up our last day in Cologne. The morning we went to get it, they hesitated for a few minutes and said that they were sorry but they couldn’t get us VW, but would we accept a Mercedes at the same price. Of course, we had to have a big discussion about that !!! ha, ha. It was a small Mercedes and was wonderful. So we had ordered one for this trip, only to get the Opal. The saleslady had told us that the Opal was a diesel, but later when we stopped to get gas we found it wasn’t and used regular gas. It also had a rough shifting pattern for an automatic – we almost got whip lash everything it changed gears. Later in the day, as we neared Florence, the air conditioning started making a loud noise so we had to turn it off. It also lacked power when we started up the mountain to our villa. That car was quite a come down from the wonderful Mercedes, Avis rented us in 2007 in Germany. We had driven in France, the Germany autobahn, and Switzerland without any difficulty. In fact, I had said that driving on the German autobahn was much easier and safer than driving on the Washington, DC beltway. So now we would have our first experience driving in Italy. 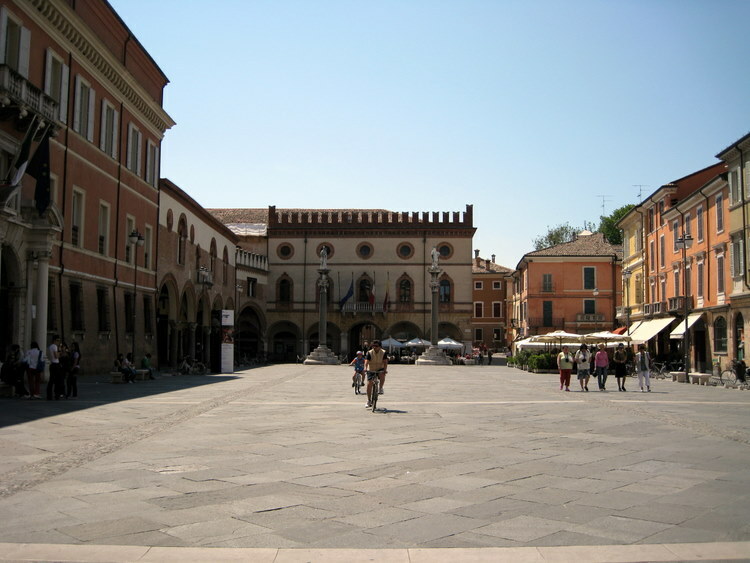 The cancellation of our flight by Iberia Airline which necessitated our starting our trip three days before we had planned was really a blessing – we wouldn’t have been able to visit Padua. We enjoyed every minute in Padua and could have stayed a few more days. We did see a lot in two days – The Cathedral, St. Anthonia, St. Giustina, St. Nicolo, Church of the Hermits, and Scrovengi with the wonderful Giotto frescos as well at the University and the Palazzo della Ragione. plus a concert. The old town was a lot of fun, and we would love to go back someday. 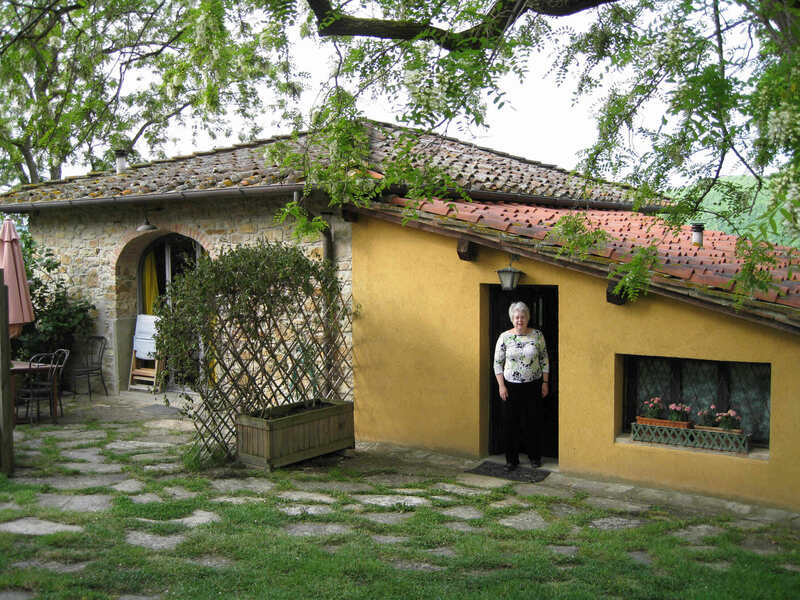 Our final destination on this day was our villa in Montoloro above Florence. It was only 140 miles south to Florence from Padua, but we had planned a side trip in order to visit Ravenna. Ravenna was 119 miles southeast of Padua. It would then be 118 miles to our villa. So going to Ravenna was a 100 miles side trip. 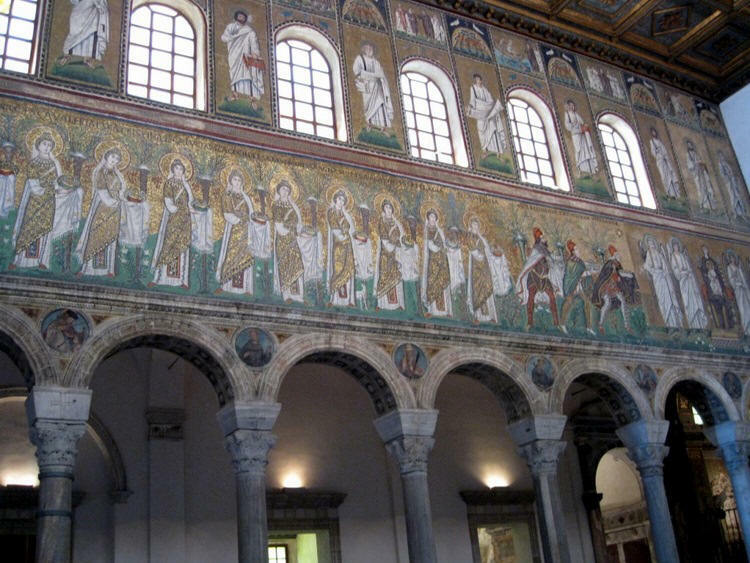 I had taken an art history class at the Smithsonian Institution and one of the sessions was devoted to the mosaic works in the Ravenna churches. The instructor, Dr. Judy Feldman, said that Ravenna would be well worth the side trip- and it was. Thank you, Judy! We were struck by how flat the land was as we approached Ravenna. 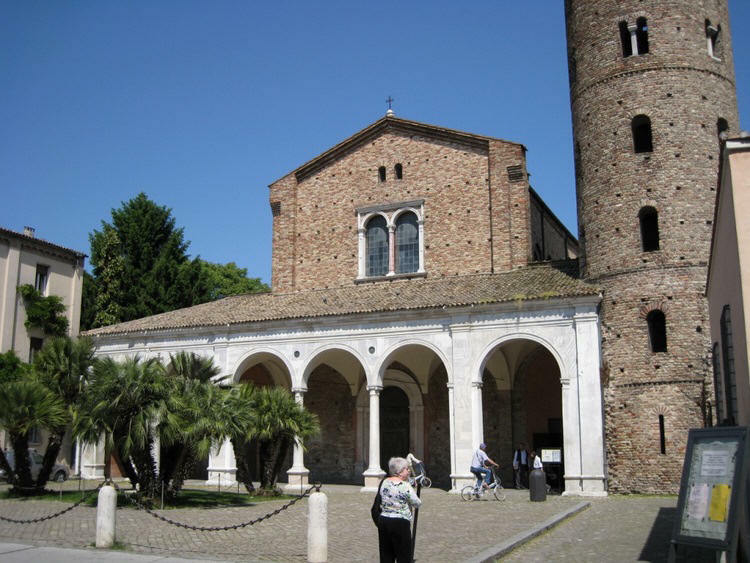 Ravenna is south of Venice on the Adriatic Sea. There were a lot of beaches in the area. Our GPS worked fine, but we made several wrong turns getting into Ravenna. The Italians don’t mark their roads as well as the German. 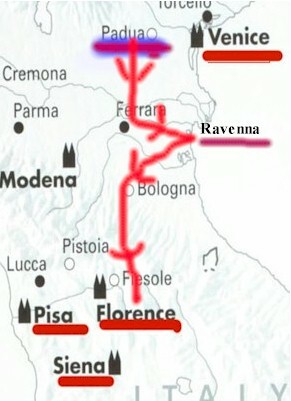 The origin of Ravenna is unclear, but evidence shows that the Romans acquired it 89 BC. Caesar gathered troops there in 49 BC. 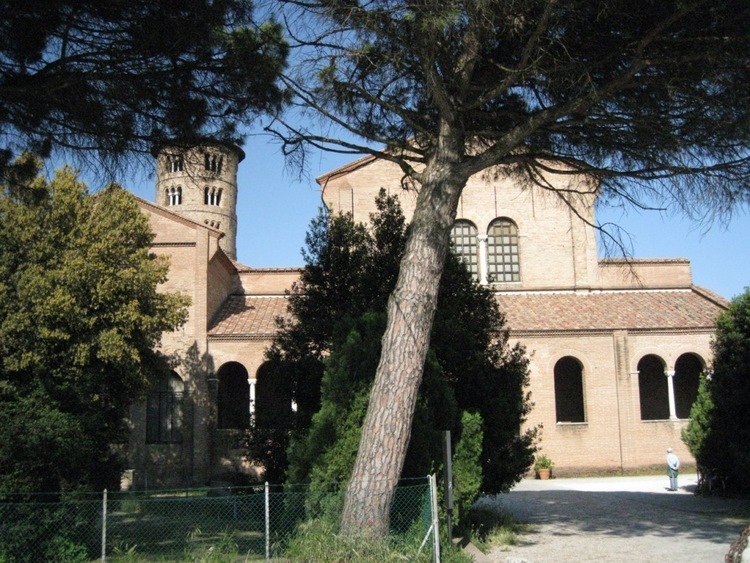 Ravenna offered a harbor that could accommodate 250 ships during the Imperial Age. 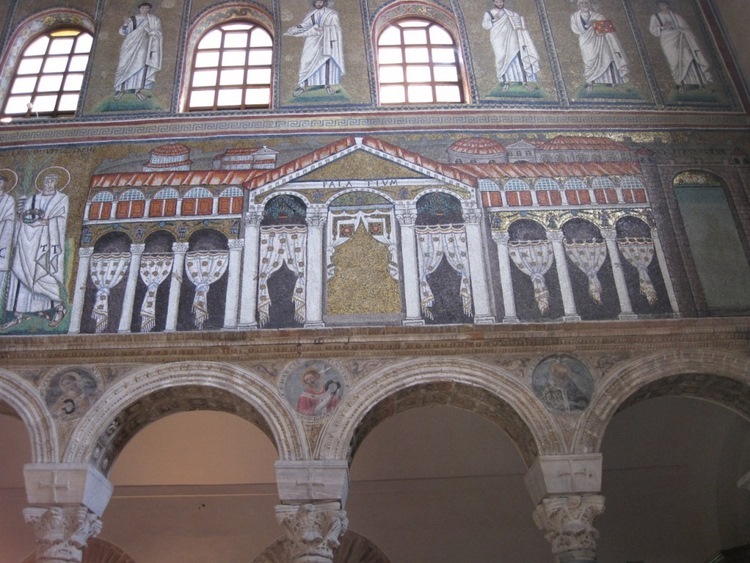 During the Roman Empire, Ravenna reached its height of splendor and wealth and became the capital of the Roman Empire. Odoacer, the German chieftain who proclaimed himself king of the Roman Empire, seized Ravenna when the Roman Empire fell in 476. After three years Theodoric, king of the Ostrogoths, killed Odoacer. 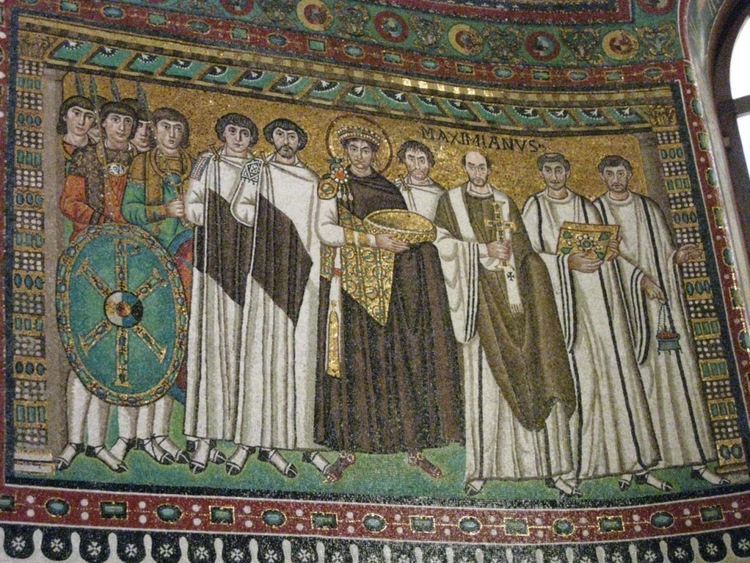 In 518 Justinian became emperor of the East and conquered Ravenna and ruled it from Constantinople. He persecuted the Arians (those who believed that Jesus is not God by nature but by adoption – condemned at the Council at Nicea in 325) and forced Theodoric to do the same. 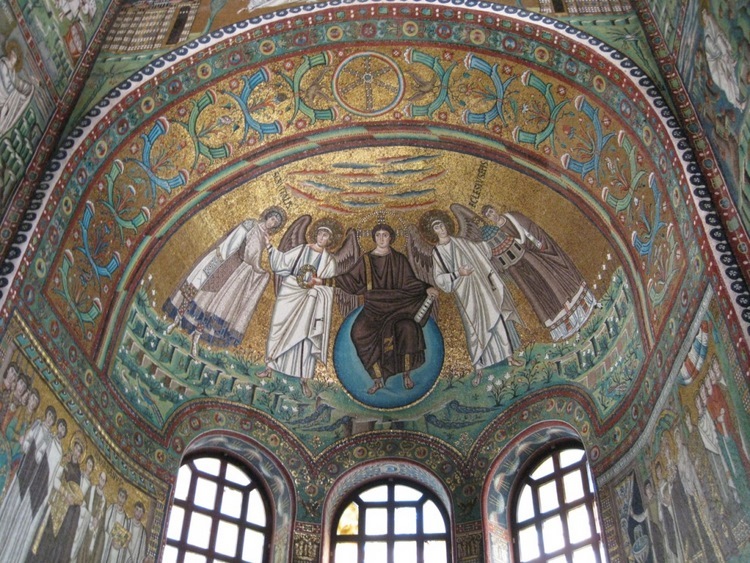 Because Ravenna spent so much of its history under the Eastern rule, its greatest art treasurers show much Byzantine influence. It is a city of mosaics. Our first stop was St. Vitale church. We found the church parking lot without much trouble. 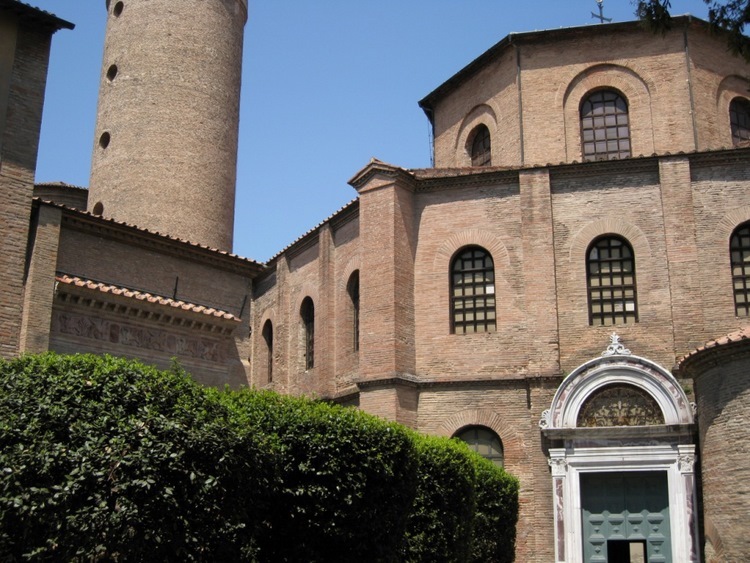 The church was named after St. Vitale, a martyr who died in Bologna in the 3rd century. The Church was begun in 527 and consecrated in 548. 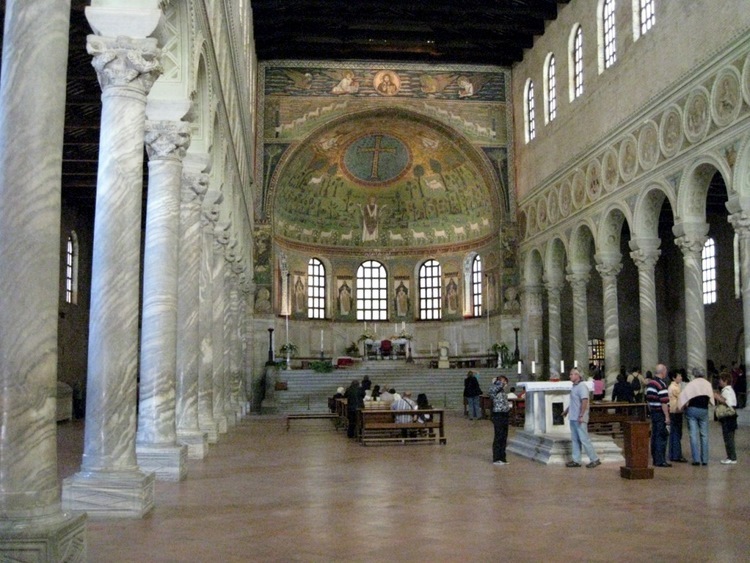 It is an extraordinary example of Byzantine architecture with influences of Rome and Ravenna. 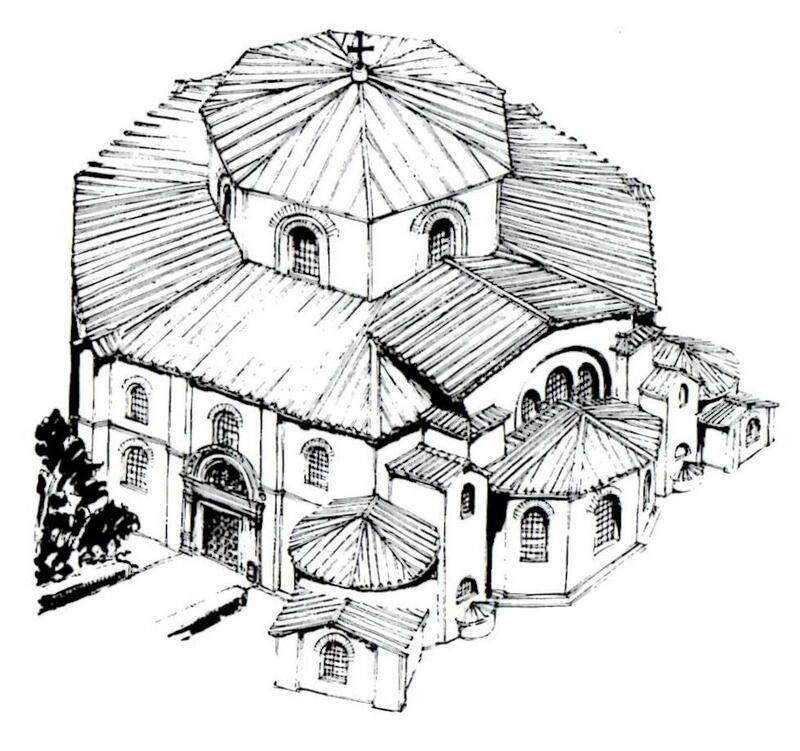 The apse is polygonal unlike other churches of Western tradition. There is an octagonal dome which measures 52.2 feet in diameter. On the inside are 8 large pillars with 8 niches on which the dome is placed. The mosaics are truly breathtaking. The apse ceiling features the enthroned figure of Christ flanked by two white clad archangels. On the right is St. Vitalis and on the left Bishop Ecclesius (527) who was the bishop who began building the church. The side wall mosaics are remarkable. On the left side is the “procession of Justinian”. Justinian, who holds a bread basket, is in procession with soldiers, clergy, dignitaries and Bishop Maximian. 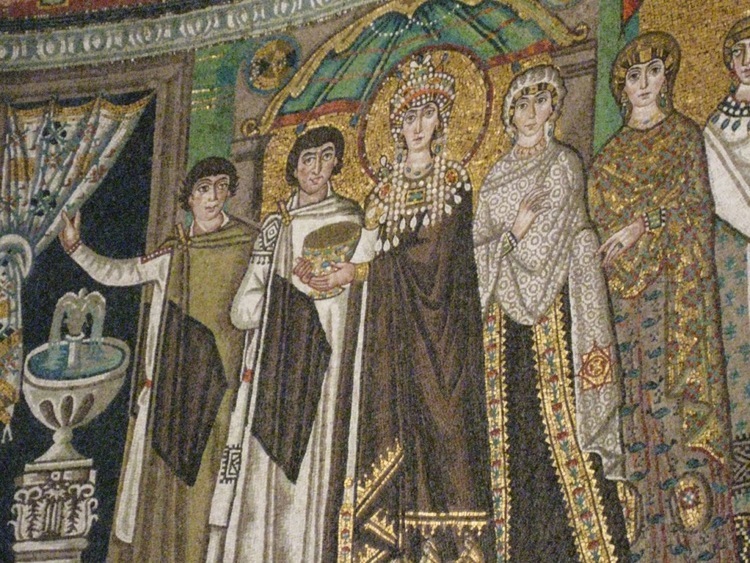 On the opposite side is the “procession of Theodora”, Justinian’s wife, and her train. Many other mosaics depict stories and personalities of the Bible. We could have stayed all day there, but we had other wonderful experiences awaiting us. After leaving St. Vitale, we stopped at a nice sidewalk café. My wife had risotto, and I had thin sliced beef and balsamic vinegar. Both were very good. After walking through Plazzo Poplo, which was a huge square area surrounded by colorful buildings, we came to Dante’s Tomb. It was build in 1921, six hundred years after he died. The tomb is in a small building. Over the tomb is a hanging light that is continuously fed with oil offered by Florence. Dante had been banished from Florence in 1302 over his political views. Long after his death, Florence wanted him back, but Ravenna wouldn’t release him. 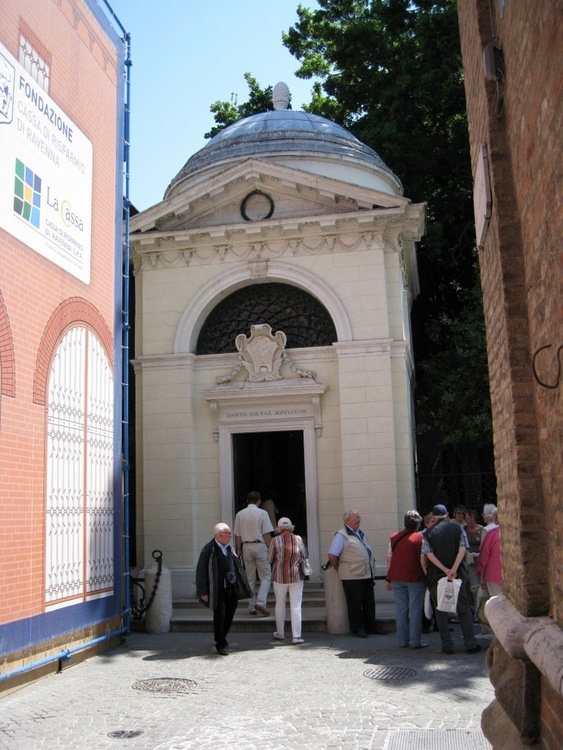 Next door to the tomb was St. Francis Church where Dante’s funeral took place in 1321, but it was closed for construction. Walking a little further we came to St. Apollinare Nuovo which was a 6th century basilica. St. Apollinare , was an archbishop from Antioch who established Christianity first in Classe, outside of Ravenna and then in Ravenna itself. We would see St. Appollinare in Classe next. There had been a controversy about where his bones are, but it was decided in favor of Classe. 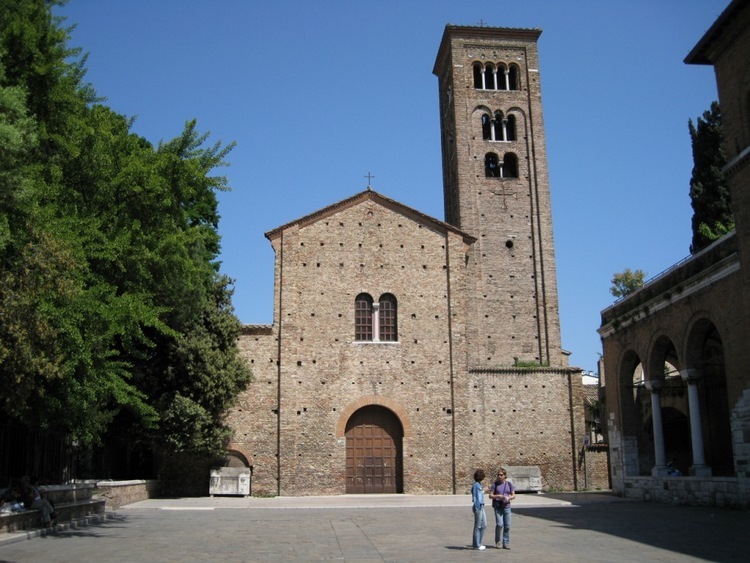 St. Apollinare Nuovo had been erected by the Arians and dedicated to Christ by Theodoric. For a while the church had been deconsecrated by the Catholics because of Arian Heresy. The church nave was one big room. The entire top of the wall were covered with mosaics. Next to the ceiling were scenes from the life of Christ. On the left wall was a procession of 22 virgins of the Byzantine period. They were all richly dressed. The three wise men were in the procession and had on red Phrygian caps. The Phrygian cap is a sort of cross between a close-fitting cap and a hood which was worn by the ancient Greeks. The right wall had a procession of 26 martyrs toward the Christ. At the end of the procession was a palace which had formerly held a mosaic of Theodoric on horseback, but he and his court had been painted over (blacked out) except for a few hands on the columns. This was done because Theodoric was a supporter of the Arians. We had to retrieve our car from St. Vitale parking lot. St. Apollinare en Classe wasn’t too far away although we made several wrong turns. The church was in a beautiful setting, sort of out in the middle of nowhere on the coast of the Adriatic Sea. It was a large church, built in 549. 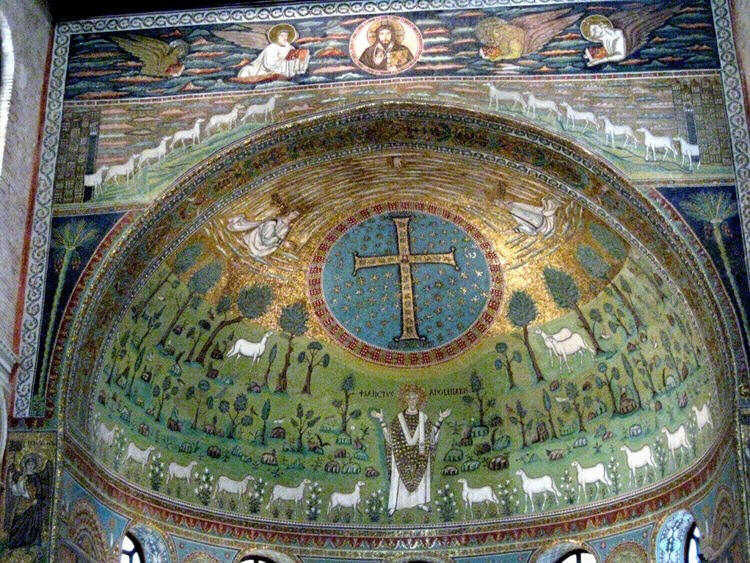 The apse had wonderful mosaic of Apollinare standing flanked by 12 sheep . In the background were trees and above Apollinare was a huge cross with the head of Jesus in the center. 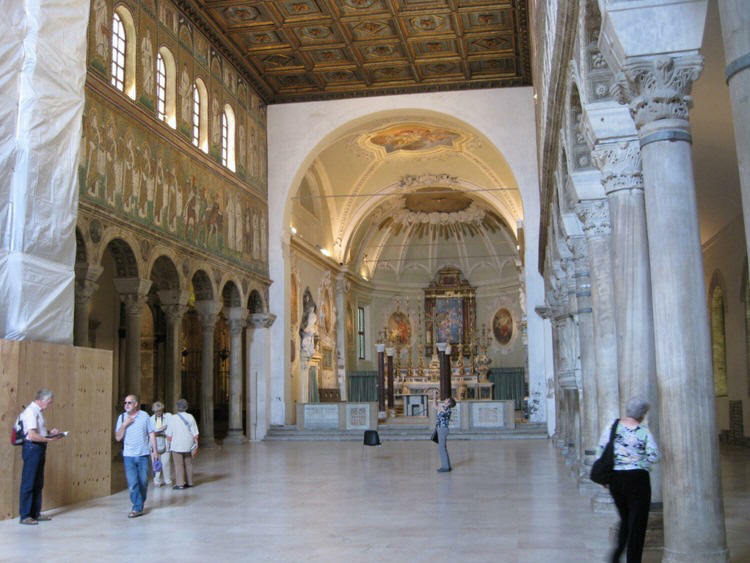 The nave, like Apollinare Nuovo, was a large room with a wooden ceiling. There are 24 interior columns of Greek veined marble. There are other wonderful mosaics at the very top and on the sides. 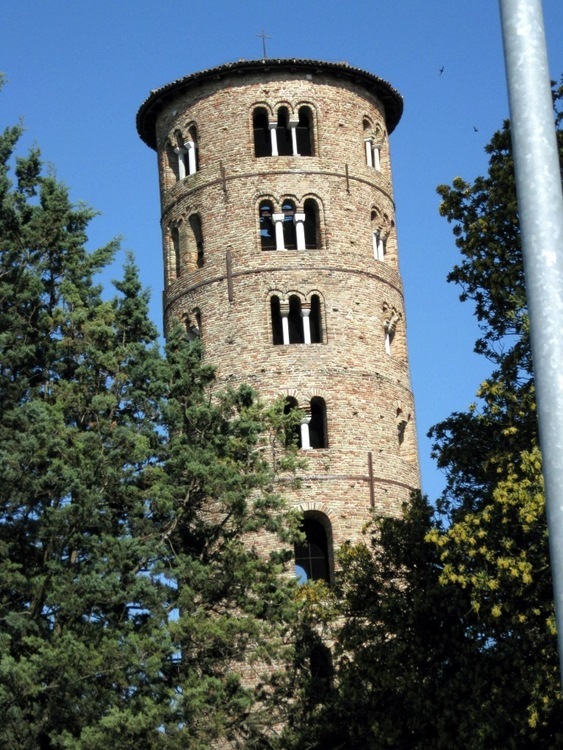 The unattached bell tower, which is 10th century, is 123 feet high. It was spared during WWII and used as an observation point for the Germans. It soon became 5:00 pm and time to head towards Monteloro. If we had known Ravenna was going to be such a wonderful town, we would have made some arrangements to have stayed another day. We started to Monteloro. Again we made a few wrong turns but got on the right road. The GPS sure is a wonderful devise to have. It was a two hour drive. We stopped for gas and bought a couple of sandwiches to eat along the way. 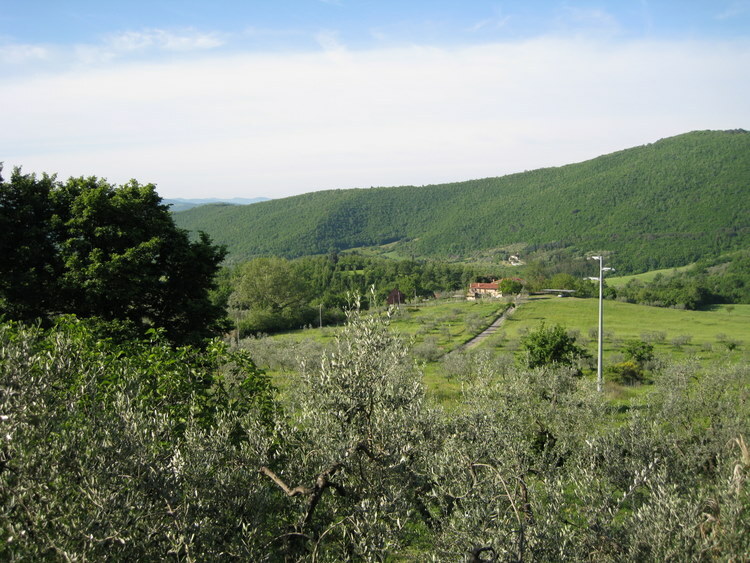 We went south east around Florence to the back side of the mountain at Sieci rather than going by Fiesole. Driving up the narrow mountain road was quite an experience. The car lacked power and kept switching gears ..more whip lash.., it was getting dark and the road was very curvy and narrow. It reminded me of one of those Italian movies with a car chase on such a road. We just prayed that we wouldn’t meet someone coming the other way. We finally came to Monteloro. Our GPS got us to the right turn- off for Monteloro and the Villa but we kept going down a very narrow mountain road. We thought that we were lost but eventually we got to the gate for the villa. There were a lot of little driveways and it was getting dark but we found it. Our friends, Mike and Mary from Alexandria, Va., who would be joining us the next day, had found this villa several years ago on the internet. They had enjoyed their visit, and they ask us to join them for a return visit. There was a large beautiful stone villa with a carriage house or it may have been a toll house in front. In that building the owners had made two apartments on the main level and one in the basement. We were shown both apartments and choose the one on the right. Mike and Mary would have the one on the left. No one was staying that week in the basem ent apartment. Both apartments had a large living room, a well furnished kitchen, a small dining area, a well appointed bedroom and bath. The view from the back windows was breath taking. It reminded us of the movie, “Under the Tuscan Sun”. Our intention has been to stop at a grocery somewhere and buy supplies for breakfast and find some dinner, but it was too late and we were too tired to venture out again, so we depended on the sandwiches we had had on the road to tide us over to morning.